In the highly competitive field of digital design, portfolios are the significant criteria for demonstrating creative ability, execution, technical skill and critical thinking. For years the design and advertising industry has remained a field not readily accessible or identified as a career by multi-cultural students. Portique (pronounced pȯr-ˈtēk, a portmanteau of portfolio and critique) is a portfolio review initiative designed to educate multi-cultural students on current industry standards, best practices and design resources. The reviews are given by multi-cultural design professionals for multi-cultural design students, pursuing design-related careers. Portique’s give design students in these underrepresented populations an opportunity to sit side-by-side with a professional from similar cultural backgrounds to have their work reviewed, discuss career options and help cultivate the creative talent of these young designers. Portique’s reviewers provide direct feedback to the student to assist them in their educational and career exploration. Exposing multi-cultural students to design professionals who mirror their cultural and ethnic identity will bridge the communication gap, aid in the understanding of the design industry and develop better qualified design personnel that can compete equitably in the advertising and design industry. 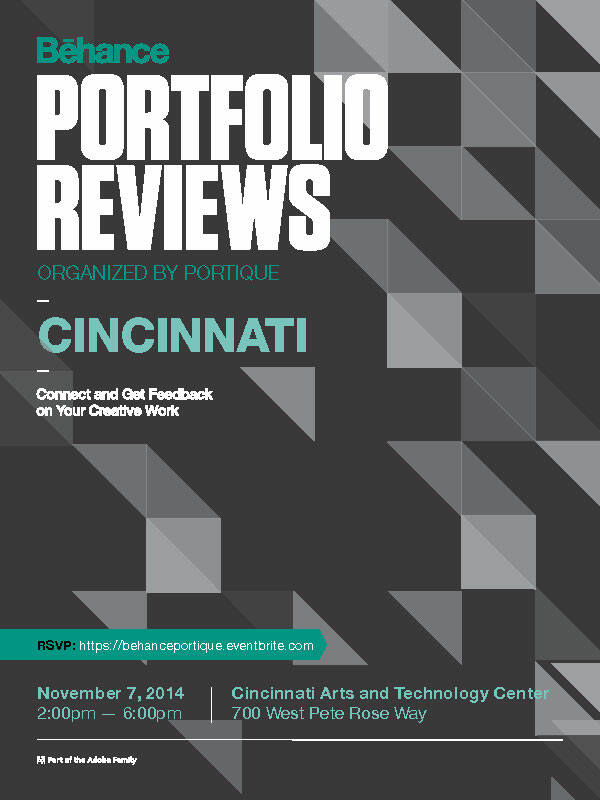 This Portique is sponsored by Behance Portfolio Review Week, and will be held from 2:00 p.m.-6:00 p.m. at the Cincinnati Arts and Technology Center, in Cincinnati, Ohio, on Friday, November 7, 2014. RSVP today to hear from our presenters, get your work reviewed and for a chance to win a 1-year free subscription to Adobe Creative Cloud. Click here to view a collage of images from the September 13, 2014 at the Creative Control Fest, in Columbus, Ohio. Students: Bring your best work and show us what you can do! Let Portique help you build the portfolio that will help with your job search and prepare you for the journey of a career. Meet with area industry professionals to hear constructive feedback on your in-progress work, build your network, get valuable career advice and gather insights to prepare for interviewing. 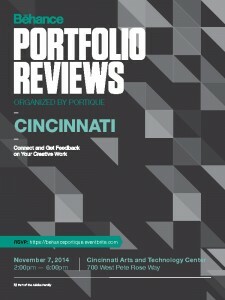 Students, fill out the form below to schedule your portfolio review. Professionals: Reviewing portfolios is a great way to help young designers, give back to the design community and be inspired by the new creative class. Please participate as a reviewer by filling out the form below to let us know your availability.